Is it really Thursday already? Is it really November 1st? Wow, my week has been super crazy and super stressful. The beginning of the week we were all stuck in the house due to Hurricane Sandy threatening our area. Thank goodness the predictions were not spot on this time. We dodged a bullet here in our area but so many are still struggling in the northeast. My thoughts and prayers to everyone who has been affected by this massive storm. My Dad had some health issues this week and ended up in the ICU for a couple days. His heart just needed a little extra help so he had surgery yesterday for a pacemaker. He is home resting now and I can not express how thankful I am for that. My parents are my world and I cannot imagine my life without either one of them in it. While he was under the weather this past weekend I took my parents a little dinner. My family absolutely loves this. Chop potatoes, carrots, and celery and place in a casserole dish. Chop chicken breast and combine. Empty cream of chicken soup in a separate bowl with chicken broth and water. Mix until combined (may be a little lumpy but that is ok) Cover and bake in a 400 degree oven for about 40 minutes or until chicken and veggies are done. Top with your favorite biscuits and return the the oven until done. 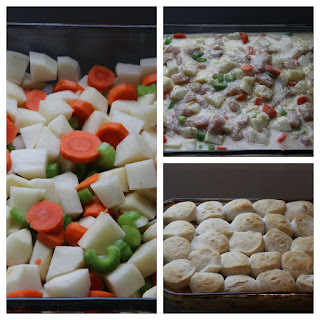 Peel and dice the potatoes, peel and slice the carrots, dice the celery and add with the chicken into a 9x13 casserole dish. Pour over 1 can of cream of chicken soup with one can of water and a can of chicken broth. Season and cover with aluminum foil and cook in a 400 degree oven for about 40 minutes or until veggies are tender. Remove from oven and place your biscuits on top and place back in the oven. Cook until they are done. Also wanted to share a picture of my little rock star. Since Mommy was at the hospital, I missed her Halloween :( Her Daddy stepped up to the plate and took her out and she didn't even notice Mommy wasn't there. Mommy was supposed to wear the witches hat while trick or treating, so Daddy had to do it ! Sure do love that man! Pinning - looks easy and simple! Found you at Foodie Friends Friday! That sure does look yummy-licious! And such a comfort for this time of year. Thank you for sharing at Foodie Friends Friday.